I hope your 50-day challenge for joy is working well for you! That is from Easter to Pentecost! I received many cards and gift cards (several for Graeter’s ice cream) to celebrate Easter. Thank you for sharing your joy with me! Our young students received First Holy Communion and Confirmation. It was a day of joy! I was privileged to go to some parties after those joyful celebrations. As you know, food always makes us happy! I invite you to join me for a “Once in a Lifetime Experience” to see the very places where Jesus walked, taught and lived His earthly life. The Bible will come alive for you. 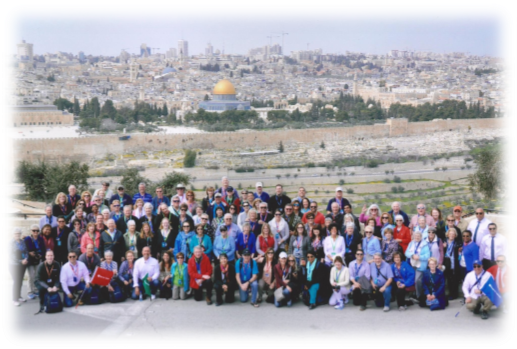 The trip to the Holy Land has inspired thousands of visitors over the years. It will inspire you as you walk where Jesus walked. It will be the most unforgettable trip of your lifetime. I am certain you will return filled with enthusiasm, gratitude and a renewed faith. Complete the enrollment form and mail it to me today to confirm your space. I would like to share this experience with you and encourage you to join me. I look forward to support you in this journey. It is a fantastic way to see the Holy Land and a wonderful way to experience faith in a new way. A parish trip is worry free. You travel with a friendly group of people and an expert guide will be available to give you details during the time of visit. All the important must sees are already included in this package. Please check the link for detailed information. Let us go to Zion glorifying Him.